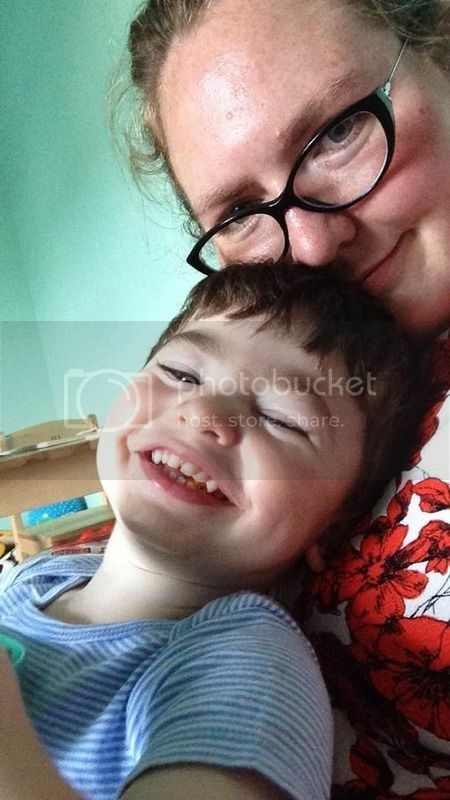 In my first week as a single mother, I not only got a flat tire on the car, but the other evening during a rainstorm, Noah and I accidentally got locked out on our second-story balcony. The tire was patched up after a quick call to AAA. A locksmith came to rescue us from the balcony. Neither of these incidents caused me to binge eat. NSV is not even a strong enough concept for this. It blows my mind, really. Because as recently as a week and a half ago, I was triggered by every little thing - as big as a fight or as small as a rude or unkind comment from my ex-husband. Noah and I sat on the balcony for nearly an hour, singing and talking and watching the thunder and lightning and rain. He got a little antsy at the end, understandably, but still - it didn't trigger me to overeat. This has been the best week I've had, no joke, in years. Every day I woke up in my beautiful, comfortable bed. I spend the morning with my son - we empty the dishwasher together, then make breakfast together, then I bring him to daycare and I head to the gym. After the gym, I clean the house or work on projects - paintings for my bedroom, organizing the closets, selling toys Noah has outgrown to the children's consignment shop. I get Noah from the school, and we have fun - one day we went to a friend's house to play in the pool/sprinklers, today we are going to the library. We make dinner together, clean up, read some books, and snuggle up for bed. After he goes to sleep and I am all by myself, I'm still not triggered or even interested in binge eating. I load up the dishwasher, I do any laundry if needed, I read, I write, I play Words With Friends, I watch Netflix (I am so into "Grace and Frankie" right now). And I go to bed feeling grateful and feeling satisfied that I did the best I could that day. I worked out every day except the weekend, when the gym was closed so Noah and I went for walks. I drank plenty of water. I tracked my food. And it was a good week by the numbers as well. I know not to expect big results like this every week, and I know these are pounds I've lost a dozen times already, but it's still so nice to make progress, even if this is well-worn territory. $5 goes into the Fitbit Fund, and I'm looking forward to finally getting out of the 300s again - for good this time. Once I get to 295, I will start Couch to 5K again - a significant number, as it's not only my 50 pound loss, but it's also the weight I was when I started the running program back in 2010. My goals for this upcoming week are to just keep up the good work. Stay focused, keep busy, and make the best choices I can. Having the rules of the Whole30 is very helpful right now - it gives me a plan, it gives me something to focus on. 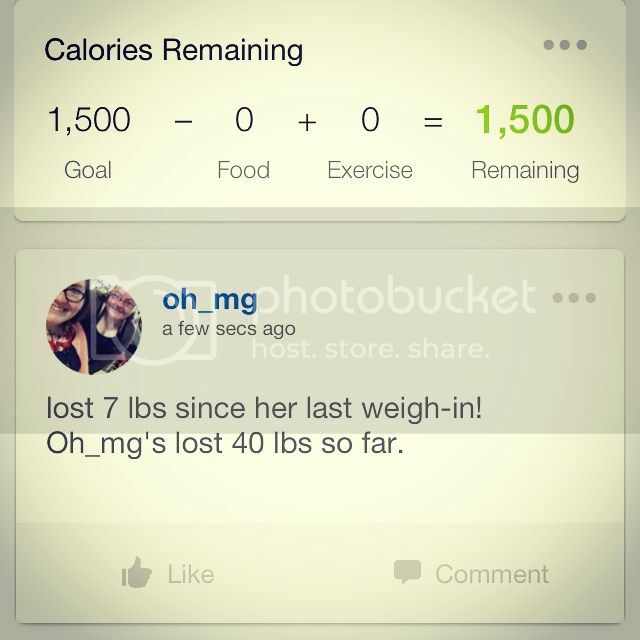 And having an audience on MyFitnessPal and Instagram has definitely helped with keeping me accountable! What about you? How was your week? Any NSVs? What are your goals for next week? Congrats on responding to stress positively! I agree that tracking and having a specific food and exercise plan helps stay focused. My funny NSV: I usually put my phone in my waist band when I wear a certain elastic banded skirt so my tracker will count steps to and from the breakroom and around the office. It usually fits snug against my hip bone. Yesterday, I got up to get more water from the breakroom, and it fell out the bottom of my now baggy skirt and hit the floor! I'm so happy for you!!! Without your ex draining your emotional reserves, you can do anything! I'm about a week binge-free. It's a huge NSV but I don't want to talk about it much because I'm afraid if I obsess over it, I'll shoot myself in the foot. What an awesome week, and an awesome uber-NSV at that! Overcoming the urge to binge is such a HUGE empowering thing, and you did it this week! Way to go! My NSV this week was wearing a button-down shirt that didn't even come close to buttoning a year ago. My goals this week including cutting back on my sugar intake--it's gotten a little out of hand recently, time to reel it in a bit. You are awesome! I'm so glad you had a great week, and way to go on not letting those sadded stressors not trigger a binge! Your NSV is HUGE!!! Congrats!